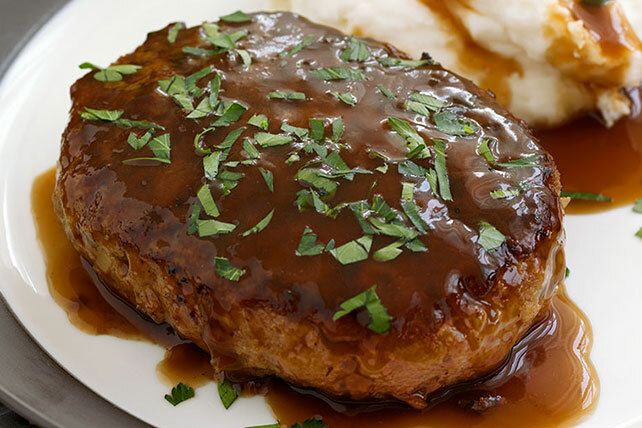 Try our delicious Salisbury Steak Recipe when you have a hankering for meat and potatoes. Our Salisbury Steak Recipe with Mashed Potatoes won't disappoint. Mix first 4 ingredients and 1 cup water. Shape into 6 (3/4-inch-thick) oval patties. Heat oil in large skillet on medium-high heat. Add patties; cook 5 min. Turn. Reduce heat to medium; cook 5 min. or until done (160ºF). Mix gravy with 1/2 cup water; pour over patties. Bring to boil; cover. Simmer on low heat 5 min. Meanwhile, bring remaining 1-3/4 cups water to boil in medium saucepan. Remove from heat; stir in potato flakes with fork. Stir in sour cream; cook on low heat 3 min. or until heated through, stirring frequently. Spoon potatoes onto serving plates. Serve with meat and gravy; sprinkle with parsley.